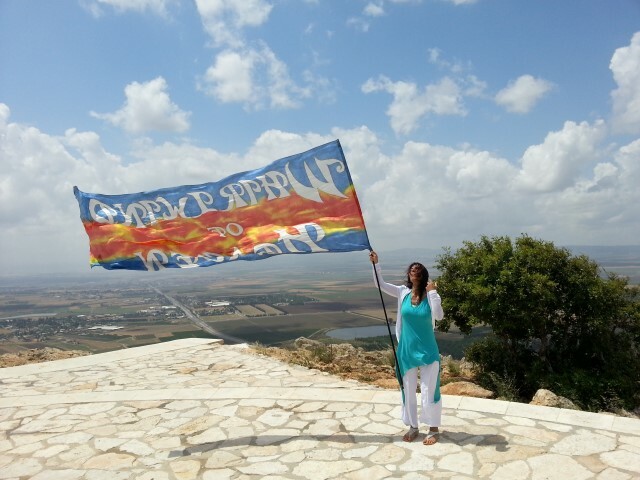 This trip to Israel was a prayer assignment led by Mary Jones of the International Christian Dance Fellowship (ICDF). The purpose was intercessory prayer at strategic locations across the nation. There was lots of prayer and some prophetic Christian dance. Pentecost morning found them in the Upper Room where the crowds broke out with loud prayer, praise and tongues, and some heard the sound of rushing wind. Refreshing. The team was composed of 13 people from 8 different nations, including a key Wheresoever member. The plan as it stands is to take 2 vans and to go from Jerusalem to Nazareth together and then to split with those from the Western gates going down the coast and those from the Eastern gates going through Galilee and Jordan. We are hoping to have meetings with local congregations at the four points of the cross: Nazareth, Be’er Sheva, Tel Aviv and Amman. 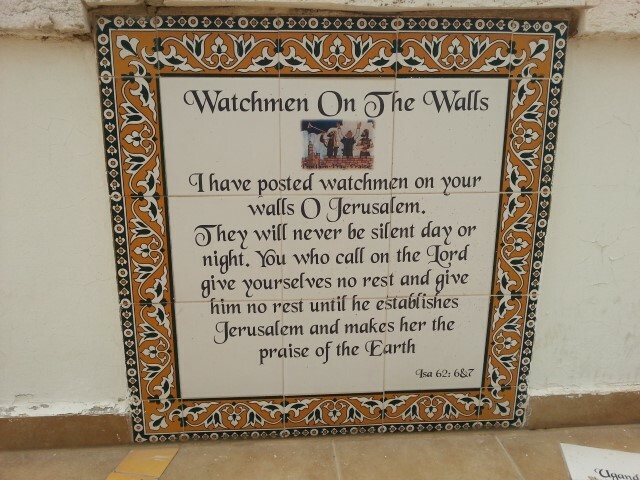 After our return to Jerusalem we will then do the southern part of the tour, the 2 vans travelling west and east and meeting in Be’er Sheva and then coming up the centre together back to Jerusalem. 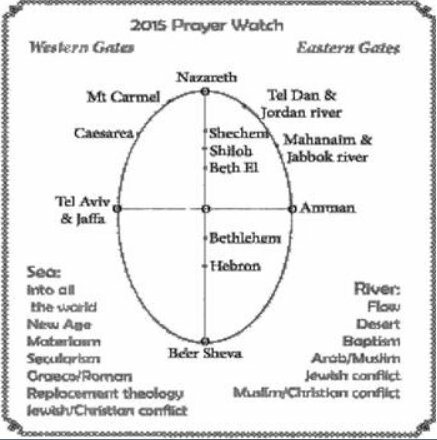 The places marked on the diagram are where we will stop to carry out our prayer strategy. I enjoyed the representation from Australia and Canada, from Sweden and South Africa, from New Zealand and Ireland, from England and me (plus some others) global. It all seemed a part of God’s plan when I was shifted from the West Team to the East, following a very interesting time in the East at the turn of the year. Turning back to my Schedule to make the changes, it seemed I had previously already marked for me the plan for the East team! I greatly appreciated the Team in all their diversity as together we lived out the Fruit of the Spirit with a determination to hold to unity so we could sincerely pray for that across the Land. We needed to consider the differing humours whether funny or apparently rude from across the world and chose to come out on the side of peace. The different cultures we are engaged in bowing to God’s Kingdom culture for the sake of a commission placed in Mary’s heart by the Lord. We had engaged and committed, we were involved through heat, strong winds, steep hills, fasting, feasting, fellowship, intercession, song and declarations of God’s grace out over His Land and peoples. We were growing, changing, opening, blossoming, connecting, holding, viewing, same sameing. Not my first choice to enter anywhere underground. I should have realised that with the mandate to pray into foundational issues on this journey, going underground in ancient Israel was more than a possibility and that depth would be required both physically and spiritually! What a highlight! Well below the surface, yet with shafts of light and bright with wild flowers peeping in, is the Shepherds cave in Bethlehem a delightful place to dance and pray. Interesting how on several occasions when we needed the use of a space to praise and pray and intercede the space would become ours for the duration. Also down, down many ancient rock steps into the cistern at Be’er Sheva, where four caverns became the four places of declaration, and an unexpected enactment of a historical situation we were trying to understand and relate to in light of todays considered offence. How does one explain the mood and the intensity of the senses when we become a part of a sound – Claire, playing her violin, new sounds, feeling involved in the sound all around, deep vibrations underground. Way back in the past, the words of understanding followed and flowed to give us reason to stand in the gap, to relate, to forgive, to be forgiven, to make all things new for today and tomorrow. Breaking spiritual ground with sound. On the combined day of Pentecost and Shavuot feasts coming together we entered the City of Jerusalem from the North South East and West meeting at a cross in the centre. We held the shape of the cross midcity. All around the world those involved in the Outer Prayer Shield joining with us in dance, prayer and declaration and celebration. Making us part of a plan so much greater than ourselves. From there we all proceeded with Flags of Fire, Water, Blood, Wind, Earth to the place marking the Upper Room. What a crowd, what joy, more ‘sounds’. Freedom to dance. The Nations were there and in so many different styles of worship. The arched stone roof echoed the sounds of song, of voices raised in prayer, the shouts of those too passionate to be quiet, the Tour guide still trying to impart information to his coach load of visitors. Quietly too there were those lost in meditation eyes shut, silent prayer and appeals to the Living God in this extraordinary atmosphere. The Nun eyes watching, watching. Those humbled before His Presence, kneeling. Some so safe they were curled up resting amongst all the feet. Others were receiving prayer for healing, for comfort, for friendship, for impartation from people or best of all from…..The Holy Spirit. Realisation - we were truly experiencing a fresh Pentecost, a fresh outpouring of the Holy Spirit for this moment for those who would receive. Sounds of many languages all around. Thank you Lord. What a day!